It was about 3.30am and I was en route from Los Angeles to Brisbane. It was a 12-hour flight, connecting from Washington DC with a six-hour layover at LAX. I was three hours from home, dog tired and unable to sleep. To the television I turned, going straight to the cooking channels, as usual. It was there I made the decision to watch Jamie Oliver’s Food Revolution. What I thought would pleasantly entertain me in the wee hours of the morning and hopefully help me to drift off to sleep, instead enraged me, upset me, inspired me and completely broke my heart. Hello increased heart rate, and hello one of the most uncomfortable things I’ve ever watched on TV. I thought teaching people to cook healthy meals was a great idea, and eagerly watched as Jamie spread the word about over-processed, artery-clogging, fat-filled food and his attempts to replace it with good, fresh produce with great flavour. My eagerness turned to despair, and then real anger as I saw his efforts met with resistance, stubbornness, ignorance and even hatred. Everywhere he turned, from school cafeteria to radio DJs and regular people, he was hated, ridiculed, despised and even lied about. I couldn’t stand it. When the first episode finished, I was desperate to know if he’d cracked the uncrackable exterior of the scared and offended people… but I couldn’t bring myself to watch any more. Eventually I relented and watched the second episode. There I stopped, when the headway he was making was so unbelievably incremental. When I was given the Ministry of Food cookbook recently by Veggie Dad, I was excited. What I liked even more was that these recipes were made to be shared, with as many people as possible. As a food blogger, I’m always careful to use recipes that are in the public domain, but some of the best are in the cookbooks I own. Here is my chance to get these delicious morsels to you! The idea of the first Ministry of Food was to ensure there was enough food to go round during war time, and to educate the public about food and proper nutrition. Thousands of women who could cook were sent out across the UK to help others. Jamie has asked the readers of his cookbook to pledge to learn just one recipe from each chapter of this book, then pass it on. To at least two people, preferably four. Then they, in turn, can pass it on, creating change with a modern ministry. Well Jamie, I accept your challenge, and forthwith offer my veg version of a comfort food staple – the classic mince and onion pie. Peel and roughly chop onions, carrots and celery – don’t be fussy, just get them small! Remove rosemary leaves from woody stalks and chop finely. Place a large pan on high heat, add 2 lugs of olive oil, the veggies, rosemary and bay leaves. Stir every minute for around 10 minutes until veggies have softened and lightly coloured. 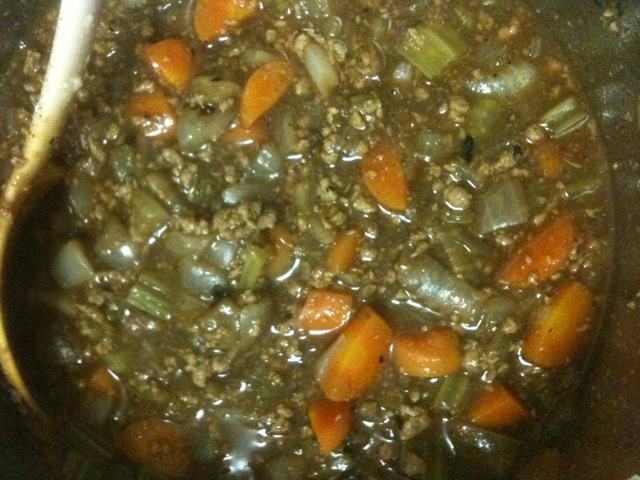 Stir in the mince and break up chunks. 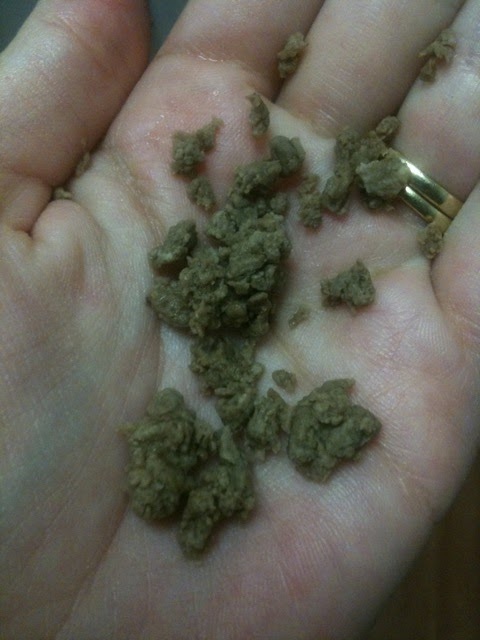 Add mustard, Marmite/Vegemite, Worcestershire sauce and 2 teaspoons flour. Dissolve the stock in a litre of boiling water and add to the pan, bring to the boil. Turn heat down and simmer with a lid slightly askew for about an hour, stirring every now and then. 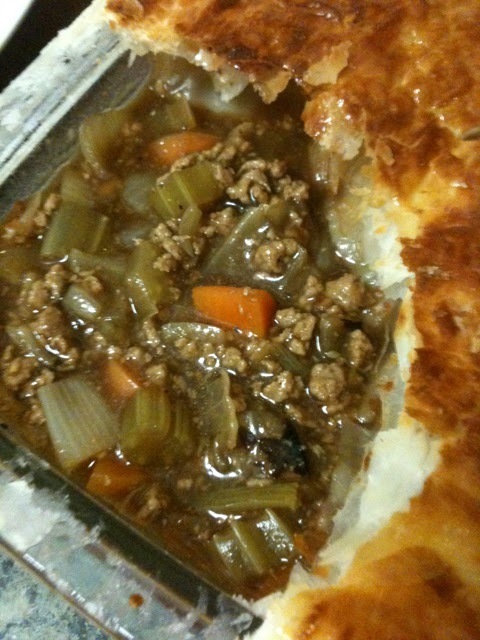 Fill a large baking dish with the mince filling and allow to cool slightly. 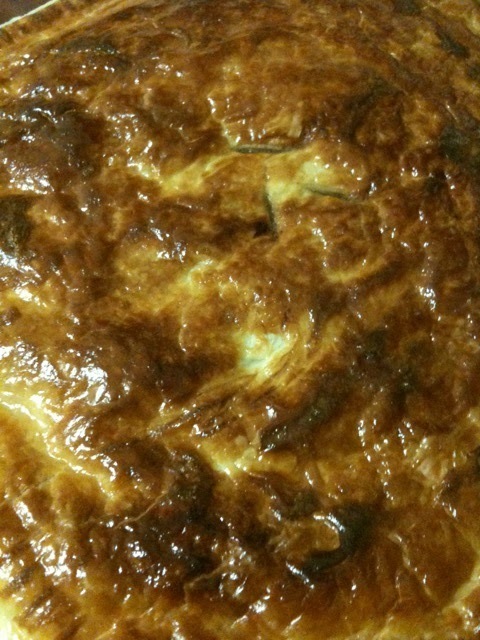 Place your thawed pastry on top of the dish, running a knife around the edge to remove excess. Using a fork, press down around the pastry to crimp it and help it to seal. Make a hole in the middle of your pie with the tip of your knife. Brush the top with beaten egg or milk. Bake at the bottom of the oven for 40 minutes or until pastry is golden and crisp. Egg helps the top of the pastry to be a beautiful, shiny, crisp brown. Feel free to use milk or even soy milk. So there you have it – learn, enjoy and pass it on! I heard about Food Revolution but never saw it (no TV!). And LAX is not a fun place to spend 6 hours – ugh. I clicked on the FB page to vote for you but the voting had already closed. Darn! You look fantastic, though. Oh thank you! Yes, we didn't quite make it this time, but thanks for trying. We don't have TV either, so have no idea what's happening in the sitcom world haha. Your pie looks fantastic, but do I dare to try making it? My version is not likely to look anywhere near as appetising. Interesting. I am not vegetarian and all things pies are still a bit 'exotic' for foreign little me, but this looks and sounds tasty – altho i admit i'd try it with (meaty)mince first. but i also watched some episodes of 'food revolution- US' in a state of horror and shock because the UK series (i had seen some in 2009 when over there) was already bad enough – but minus the open hostility. The exact same happened to me.. en route to China so I had 9 hours of Jamie’s 30 minute meals.. drooling and ready for something deelicious but nowhere to go!